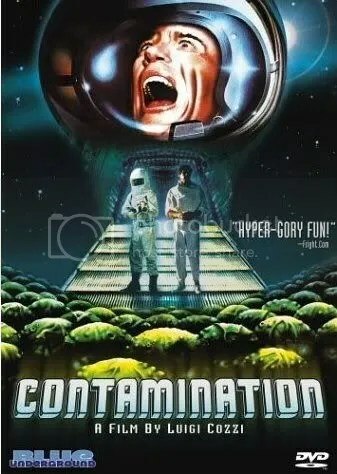 John’s Old School Horror Corner: Contamination (1980) aka Alien Contamination, a cheap, poorly executed, un-thought-out Alien rip-off. MY CALL: As tasteful and organized as a man’s detonated entrails, this movie is a cheap, poorly executed, un-thought-out Alien rip-off. After the first couple scenes it loses any promise of being a fun “bad” horror flick. I’ll give it a “D” only because I enjoyed the beginning. WHAT TO WATCH INSTEAD: Just stick to Alien and The Thing (1982) if you want an alien-contamination creep show. IF YOU LIKE THIS, WATCH: Probably any “Roger Corman presents” classic. Other gory sci-fi horror of the era include Galaxy of Terror (1981), Forbidden World (1982) and Inseminoid (1982). This corridor looks nothing like the corridor in Alien. A strange, unmanned Caribbean ship approaches a New York harbor and is quarantined. Upon investigation, members of the crew are found “ripped apart” to various degrees, one of whom evidently appeared to have exploded like a small bomb was inside his chest. They also find a huge shipment of coffee bean boxes filled with over-sized avocado-like egg things that are bioluminescent, pulsating, somewhat translucent and covered in green ooze. These eggs should clearly come with a warning label indicating that handling them results in their detonation, spraying you with acid, and somehow causing your chest to explode. These “eggs” turn out to be more than just eggs and—dun, dun, duuuuuuuun—of alien origin. Our investigators discover a warehouse full of them in the Bronx. They connect the dots to an international conspiracy which includes NASA and the Colombian coffee industry. This may sound exciting, but after the first 20 minutes (which were delightfully gore-tastic) this movie really slows down to a disinteresting pace where scenes devoid of action are needlessly dragged out. Clearly this flick was made to prey on sci-fi fans left hungry for more since the release of Alien, which also had chest-burst-inducing, extraterrestrial, acidic, slimy eggs. What a coinky-dink, right? The concepts are conveyed poorly and the three portions of the movie (the first 20 minutes, the next hour, and the last 20 minutes) each included a new plot element which linked poorly, if at all, to the others. The makers of this atrocious flick clearly had no idea what they were doing and forced out this movie with all the grace of passing a kidney stone. Don’t watch this unless you stop it after they investigate the ship in the very beginning. FYI: This movie was Contamination but then retitled Alien Contamination in 1982. You’ll find both on Amazon with the exact same info. The catchphrase on the movie poster “You will feel them in your blood” does not apply to any single aspect of this movie at all! WTF!? !